Gelsenkirchen - FC Schalke 04 maintained their pursuit of a top-four finish with a 2-0 victory over Hannover 96 in Sunday’s Matchday 20 curtain-closer at the Veltins-Arena. Goals late in the first half from Jefferson Farfan and youngster Max Meyer sealed the win that made it nine points out of nine to start 2014 for the Royal Blues, who remain just two shy of third-placed Ruhr district rivals Borussia Dortmund and four clear of closest pursuers Borussia Mönchengladbach and VfL Wolfsburg. For new Hannover coach Tayfun Korkut it was the first taste of defeat in the Bundesliga after a two-game winning start. Schalke started like they meant business against a Hannover side packing bodies into the midfield early on, with Farfan looking particularly lively down the right for the hosts. Their first scoring opportunity came with twelve minutes on the clock, Kevin-Prince Boateng teeing up Klaas-Jan Huntelaar for a first-time shot that forced an excellent save out of Ron-Robert Zieler.The following half-hour passed with the Royal Blues continuing to dominate proceedings, and possession, but unable to make any further serious inroads into the Hannover defence. The breakthrough came with the interval fast approaching, and it was down in no small part to Sead Kolasinac. The 20-year-old left back powered past Marcelo, before playing a low ball towards the far post, where Farfan was on hand to tap home his eighth goal in 15 league outings this season. Things swiftly got better for the Royal Blues as they doubled their advantage a minute before half time. Farfan found Atsuto Uchida with a pinpoint pass, and the right back’s cut-back was left by Huntelaar for 18-year-old Max Meyer to put the finishing touches to a fine Schalke move with his fifth goal of the campaign. There was little change to the general course of the contest after the interval, with Hannover unable to shift into the more active forward gear the situation demanded. 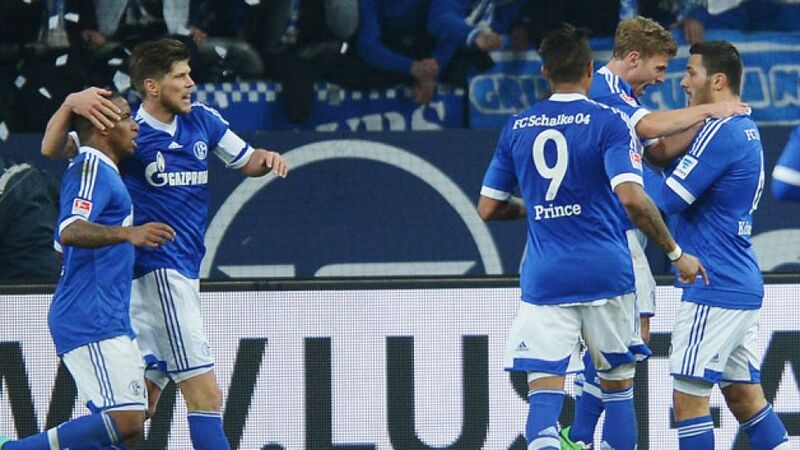 Schalke, meanwhile, were carving out further chances, Huntelaar heading just over the bar with a close-range header. With just over an hour gone, Zieler safely held a deflected shot from distance by Kaan Ayhan, another promising Royal Blue prospect who had replaced the injured Roman Neustädter before the break. After a temporary lull in the action, the 96ers keeper was forced to make smart saves from Meyer and Boateng, responding excellently to both attempts to keep his side - theoretically at least - in the contest. In reality, Schalke were headed for a thoroughly merited win, as underscored by a final tally of 15 attempts on goal to Hannover’s four, and the Royal Blues' season continues to proscribe its upward curve.